The Town of Gilbert is helping businesses brag about what they are doing to save water. You'll know a business is conserving when you see a Water Wise Gilbert decal in its window or yard sign in its landscaping. 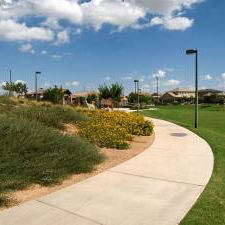 Water Wise Gilbert encourages restaurants, apartment complexes, churches, HOAs and other commercial properties to take advantage of the town's free water audits. These professional indoor and outdoor Water Efficiency Checkups help businesses find ways to save money – and water. Commercial customers consume about 21 percent of Gilbert's water. When the town helps business owners save on their water bills it means more water will be available when it’s needed in the future. Here are the steps a business can take to become part of the new Water Wise Gilbert program. Schedule a free Water Efficiency Checkup with a Gilbert water conservation specialist. Promote your conservation efforts by using Water Wise Gilbert marketing materials provided by the town. Marketing materials include Water Wise Gilbert window decals, table placards and landscape signs explaining the ways your business or property is saving water. Maintain the water savings on a monthly and annual basis. Gilbert will track the savings at each business and use the data to improve the town’s water conservation programs. The town already has a program that offers free irrigation assistance to HOAs. The town also scans commercial water consumption each month, looking for water use that has doubled or tripled from one month to the next. Water conservation specialists then contact these businesses and offer to find the source of the spike. Sometimes, businesses contact the town seeking ways to lower their water bills. Here are a few examples of how water conservation experts recently helped commercial properties save money. Specialists recommended a large church install faucet aerators that reduce water flow rate from 2 gallons per minute to .5 gallon. A simple valve tune up helped reduce the water use of 12 problem toilets. The specialists also determined the church was using far more water on its landscaping than the landscape needed to thrive. They recommended adjusting the church's irrigation schedule and installing new pressure regulating heads for their pop-up sprinklers. The church now receives monthly updates about its landscape water use from the town. A manager at a fast food restaurant couldn’t understand why her water bill was so high. The town’s conservation specialist discovered that the restaurant’s sophisticated reverse osmosis water filtering system was recycling far more often than recommended. The specialist suggested the owner call in the contractor. The water use in one building of a large apartment complex jumped from 18,000 gallons a month to 130,000 a month. A specialist downloaded hour-by-hour water-use data for the previous 30 days available from the building’s indoor water meter. Looking at the numbers and the amount of water used, the specialist suspected a leaking toilet. They could also see from the data the exact hour that the excessive water use stopped. Apparently, the leak had been caught and corrected. If it hadn’t been, conservation staff would have notified the building manager and directed the manager to the source of the problem without even having to visit the property. Gilbert conservation professionals plan to kick off Water Wise Gilbert in the town’s Heritage District. These businesses, including many popular restaurants, are highly visible to customers and other businesses. This program isn’t for every business. It’s only for those that want to cut costs, show they care about conservation, build a loyal following, save energy, and create a distinctive and thriving desert-adapted landscape. Interested? Here's where you can apply. Gilbert is one of many cities that offer businesses free water audits. Check with your city’s water conservation office to see what services it offers to help your business save money – and water.